Amaze the onlookers by wearing this amazing chronograph watch that comes from the house of Casio. Featuring an attractive dial, this timepiece exudes elegance and style. The strap made from a premium quality resin material is sturdy and promises a comfortable fit when you adorn your wrist with it. 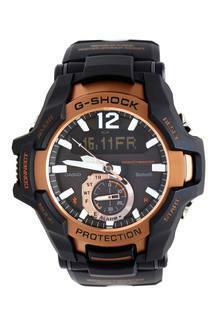 It comes with a two years warranty and water resistant capacity up to 200 meter which makes it more durable. Pair this stylish chronograph watch with your attire and look smart. It sits comfortably on your wrist and is a distinct addition to your collection of accessories.